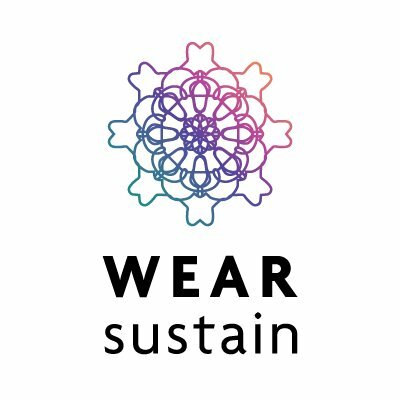 Last December we opened our tailor shop and wrote a post about our intentions to contribute to a more socially and environmentally sustainable attitude in production and consumption of wearable technology by focusing on Longevity. In this post I would like to capture some of the thoughts that went through my head as I was making and making decisions about how to make to be more “logevical”. For the sake of some kind of organization I will try to order my collected thoughts in these aspects. The images in this post are not (always) directly related to what I am talking about, but they depict the various projects, problems and solutions we have been working on these last two months. Making our e-textile circuitry robust enough to withstand regular wear and tear was already a consideration in making the items of our Opening Collection. It seems an obvious necessity for something to last a long time, to also “hold up”. But I think we take this aspect too strictly “german-style-engineering” with the idea robust things take care of themselves and last forever with no need for extra care. Here I observe how we ourselves are influenced by how the society we grew up in thinks about the products we consume. The maker/manufacturer is responsible for delivering a robust product that is as easy as possible for the user to maintain. But what about something that has the opposite characteristic? Maybe going back to nature, “a plant”. If we buy a plant, one of the first considerations we have is how to care for it. And we know that if we don’t care for it, it is our fault if it dies. Even if the winter was colder than we expected, or we had to go away on an unplanned trip. When we come back to a dead plant, we blame ourselves, we won’t blame the plant or the garden center that raised it, nor the shop we bought it from. But if we buy a sharp cutting knife and we wash it in the machine and it goes blunt rather quickly we might blame the maker (the manufacturer, the company, the brand, the employee who sold it to us). We did not think that we had to take care of this knife, to wash it by hand, to cut properly, to store separately and to sharpen yearly. Maybe when we buy a new knife it should have these instructions on the packaging (and most good knives do). Maybe the law should require that we bring it for a yearly checkup (TÜV, MOT), maybe the knife should be given an artificially intelligent voice so that it can tell us what it needs. Maybe the designs that we make can also take “care” into consideration. Although where to draw the line between care and fixing? Sharpening your knife vs. having to bring it to a knife-smith to have a big dent hammered out. So I don’t have any concrete example of how we built “care” requirements into any of our pieces so far, but I do think that transparency has a lot to do with communicating the necessity for care, because when you can see something going wrong, you can react before it is too late. The plant will look dry or limp, letting you know it needs care. 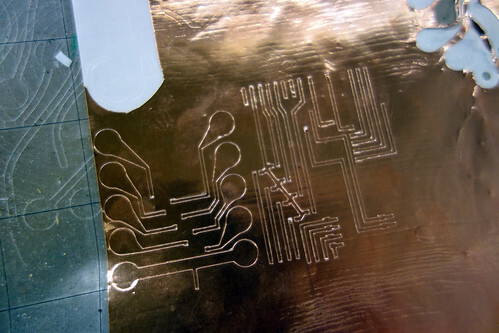 Vibration motors mounted on plexiglass with electrical connections broken out to copper tape on either edge. 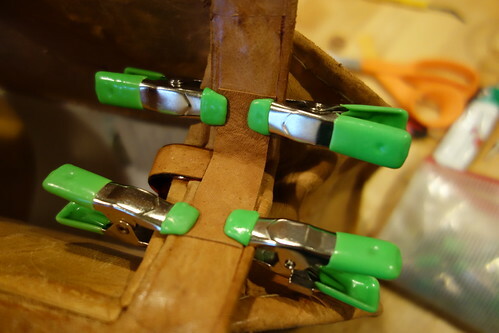 These boards are then inserted into the circuit which runs around the waistband of a jumpsuit. 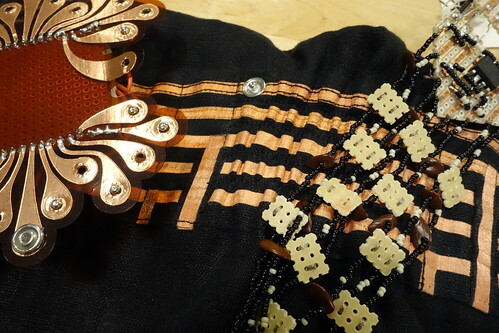 This design means the boards are easy to remove, replace….. Open question: will the electrical connection be sturdy and withstand wear of the garment. While we did not consider care or maintenance as a required factor in our designs, repairability is definitely something we are considering with every design implementation we make. But by not casting things in epoxy or gluing them permanently together, we are making them more breakable. But of course also more repairable. And when something breaks, can the user fix it? Or can the user find somebody with the right skills to fix it? What information do you need to fix our designs? 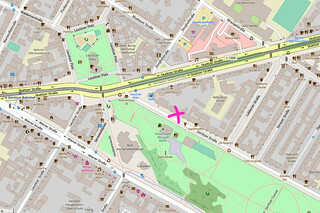 Where should this information be stored and how can it be linked to the work so that the person needing the information can find it? If my printer breaks, I can google the manual online and find a PDF because the brand name and model number are printed on the device. We are thinking of sewing in woven tags (so that the text will never wash out) with the URL of the KOBA on them (www.KOBAKANT.at/KOBA) and from there you can scroll through a list of commissions to find yours. This works because we will have an oversee able amount of items. What information does the user/repairer need to fix the design? Checklist for possible (known) breaking points? Step-by-step documentation of how it was made? Can the user/repairer contribute to this documentation by leaving “error reports”, “bug fixes”? I want to open up the comments section on our website so that users can become part of this process. A sewable breakout for the ATtiny mircocontroller to make the sewn connections more robust against strain from tension and movement VS. soldering the ATtiny directly to the ends of the solderable conductive threads (no real strain relief). All the commissions we worked on so far do not require excessive washing, and will probably wait some time before they ask for their first wash. But still, for all of them we make decisions so that they will be able to be washed when needed. 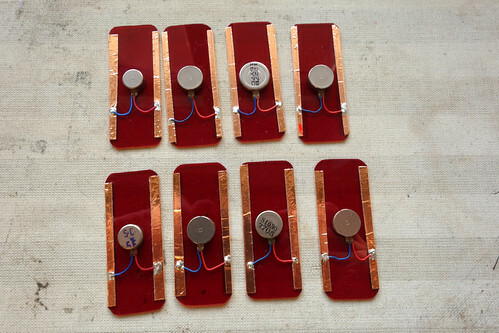 Batteries are unpluggable, and unmountable with no need to undo stitching or soldering. In some cases the microcontrolelrs are also removable. But what about the details of the act of washing? I actually think we have completely avaoided really testing our desgins in this process. An easy answer is to say you can/should/must dry-clean the item. But what does this mean? There are many articles on the Internet on Laundering vs. Dry Cleaning. Both have their pros and cons, I don’t think it is about promoting one over the other. Or maybe it is!? What I think we should do moving forward is to test some of our designs in hand-washing and dry cleaning processes. In hand-washing I’m most concerned about the physical forces on the circuitry and connections. In some cases you might only be able to soak and agitate gently in the water, then strain with extreme care and hang to dry quickly in a warm place. The dry cleaning process used chemicals to remove stains and oils and I have no idea how these would effect the conductive materials we use in our designs. We should read up more about this, and test it. And maybe there are new ways of washing to be invented and developed. Many of the conductive materials use silver which has antibacterial properties and thus kills germs and odours. New coatings for textiles make them more stain and smell resistant….. Although the concept of freshly washed sheets dried in the sun is incredibly emotional, it might be incredibly energy inefficient compared with new ways of NOT washing. “Please note that some shielding fabrics are not washable at all, and some can be hand washed only. Please read and follow washing instructions that come with your product. Robustness and Durability – In order to care for something you need to know all about it. Since devices don’t (yet) have voices to tell you what they need, you need a user manual, a datasheet, some form of care instructions so that you can get to know the things you own. Washability – in order to know how you can wash an item you also need certain kinds of information. What is the item made from (will these materials be affected by certain chemicals used in washing detergents, processes…), what are the recommended washing instructions? What other kinds of transparency and reasons for being transparent exist around the objects we make? How much did the item cost to make (BOM, labor hours, infrastructure, R&D…). Transparency in moral, intention, storytelling. Honesty. Stories sell products. There was a time when Brands switched from putting the product in the foreground, to putting a story in the foreground. If you are adventurous you buy North Face gear. If you care about animal rights you buy Body Shop products. If you are cool you drink Coca Cola. Are these stories true? Does the law require them to be true? Do we believe them? Do they influence our purchasing decisions? No, they are not always true. Yes, they influence what we buy. We are sold lies, fake stories that make us buy the product. But “stories” are per definition make believe, so who can we blame but ourselves for believing in them? Our tailor shop is a dishonest story – a fairytale. We are making believe. We want to know what people would want if there existed a tailor shop model for making technology. So we pretend this tailor shop exists as a real business and not an art project. And we are torn on this because on the one hand we are using the fakeness of the shop to speculate about alternatives, but for it to work we need people to fall for this story. And to act upon their belief in a lie. 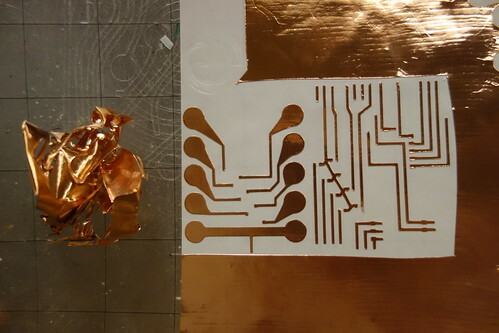 A flex circuit made using copper tape stuck to both sides of kapton film. So we are using our story-telling powers to create attachment with the custom-made, hand-made, made-to-order items we produce. How do we tell this story and how does it create emotional attachment? We tell the story through telling the story, quite openly we explain what the project is about. But this remains on a more conceptual level. How about the more experiential side of this story? You enter a shop that is also a workshop. Where things are made and you meet the makers. We offer you tea. We talk, we don’t have anything to sell, but are making strange things. We are making art and asking you to imagine what you might want. You live in the street and walk by our shop regularly. You see us working late. You see how we work and what we produce. You get a sense for what it takes to develop wearable technologies. 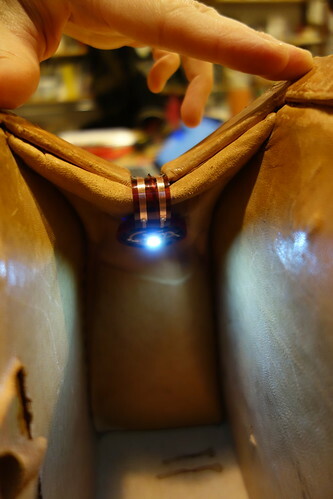 At some point, somehow, you get an idea for something wearable, something soft and technological. Maybe the idea is silly but kind of cool. Usefull but kind of silly. Usefull and very personal…. and you make the link to our shop. And you begin to consider going to the shop to talk about your order. Maybe it is just a nice idea to talk about, maybe you urgently want to have it. Maybe you just wonder what we think or if we could make it. You come in and we talk and your idea morphs into something quite different, but something very do-able and you want us to make it. We drink more tea, we take your measurements, we ask you lots of questions and you have to select colours and fabrics, and placement of sensors. You sign our Artwork Disclaimer and agree that we may document your commission as part of our storytelling. You go home and follow the progress of us developing your commission via Social Media (Diaspora, Twitter, Flickr…)… you come back for a fitting and final adjustments. You come back to pick the final piece. We give you the documentation which contains the pattern, circuit diagrams, code, a list of all the materials and parts, how many hours it took us to develop and make. We talk about the price and you want to pay us a good amount but can’t afford it because of course it took us very long to make something custom for the first time just for you. But we talk about this issues and decide on a good price and you are happy and we are happy and our story continues. Now. Are you more emotionally attached to what we made for you, than the cellphone you’ve carried around in your pocket for 3 years? Fixing, upgrading, augmenting, editing something existing to make it usable again, more desirable, more attractive…. What is the difference between repairability and hackability? Hackability is more than providing documentation to fix somehitng, it is an invitation to get involved by understanding, modifying, upgrading, changing what somebody else has made. I don’t think that hackability is something we would plan into a commission by default. but it is definitely an aspect we would incorporate if the user showed an interest in getting involved in editing the item later by themselves. 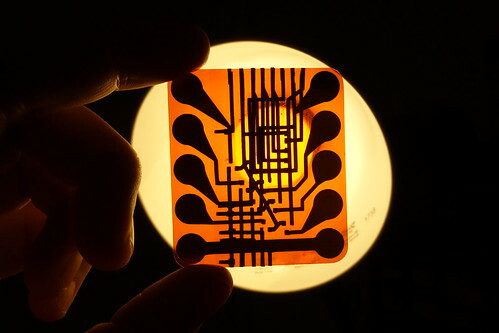 This could mean breaking out extra i/o connections on a microcontroller so that more sensors or actuators or other devices could be easily connected later. It could mean keeping in mind easy access to certain parts so that they could be exchanged…. To write more about this, I think it would be fun to have a more concrete example. Maybe somebody reading this has something in mind and will come by the shop soon? 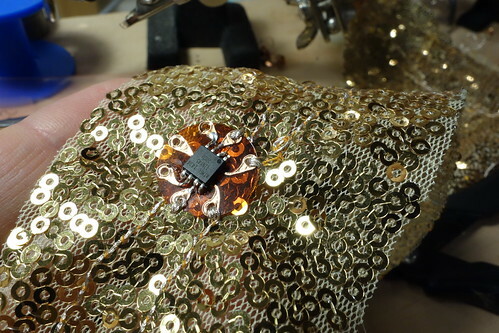 Layering different materials together to construct two fabric push buttons. The layers will be sewn together. Style is part of storytelling because what we recognise in what we see is linked to what we think of what we know. If we use certain materials, colours, shapes, patterns…. we are making use of an existing language. What style is our language? Should we put out work in our own language, or is not being a tailor shop about being the mediator of other people’s ideas and to enable them to speak in their own tongues? In our first Shoptalk discussion, Rachel Freire talked about the role of her own artistic work has in attracting clients and helping her to make decisions. Even when somebody knows what they want, they come to you for a reason, because they see something in you that speaks to them. Being a tailor is not about being a machine that makes on demand by command. 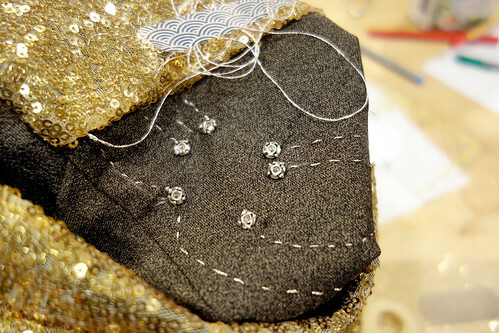 The tailor is part of the creative process with their own voice. But still, what is our voice? I think with our Opening Collection we put out a set of wearable technology garments that have a certain style. But we did not talk about our style (KOBAKANT or Mika and Hannah) as being a considered/planned propagator of our story. I feel our style is something we are discovering and developing as we go along. By becoming more aware of it we become more able to deploy it as a tool for communication. If we find time to work on a next Spring Collection, we should make more conscious decisions of how we employ style as a storytelling element. 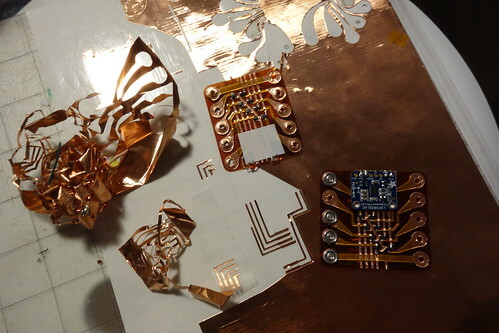 Using snaps so that the Flora microcontroller can be removed/reused…. This point relates to transparency, but particular to aesthetics and also the time it takes to make. 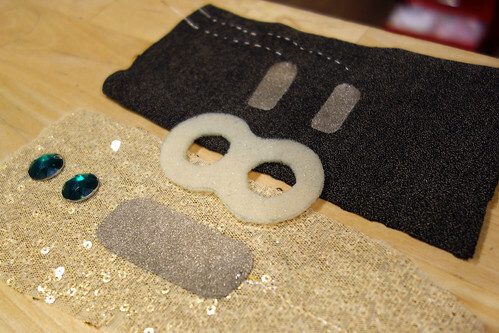 When we were sewing the Discolele circuit onto the sequin fabric of the Discolele jumpsuit we decided to sew the power and communication lines onto the back of the outer fabric. This meant they would not visible. And when something is not visible you can care less about about how it looks. And if something looks good it tends to be well made? Question 1: If something looks good, does it tend to be well made? Question 2: If something is visible, does one pay more attention to detail and making it look good? If the answers to these questions are yes, then should we aim to make everything visible so that we make better quality work? Put all the circuitry on the outside. Hide nothing! 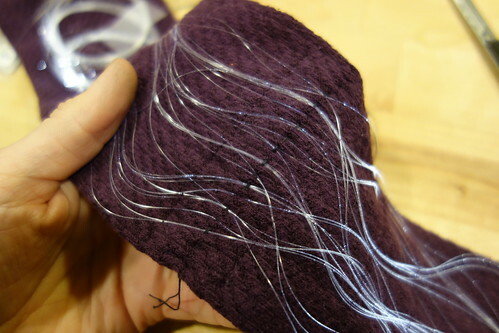 Turning fabric from old tights into a headband and adding fiber optic strands, an LED and battery to light up the design. – Transparency: showing off, rather than covering up to make technology more visible, more understandable, more repairable…. – Optimal use of materials: trying to use less material by laying out patterns and circuit traces… –> more time, less material? 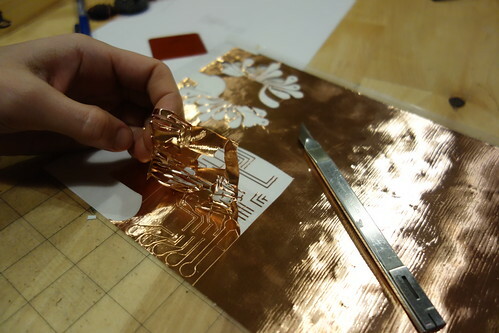 The copper cut, removed and trashed in order to cut a few skinny traces for simple circuit. A nice quick prototyping technique. But what a lot of waste. And in the end nothing will last forever. Not at all to use this realization as an excuse. But a realization that things will break and fall apart, and end up becoming trash. The above collection of thoughts is not complete in any way and maybe sticking to this organization structure and updating it with additional posts every month or two would be a way to track our process and progress of developing our ideas of and for longevity in our work. The last idea that came up “more time, less material” is something I would like to write more about and will try to do so soon.